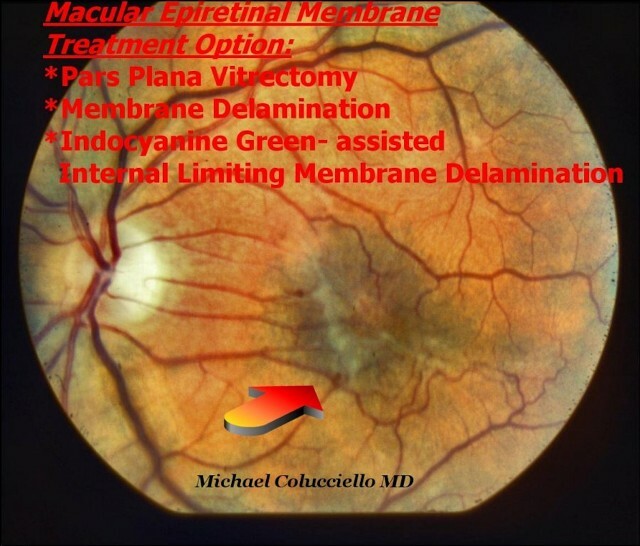 A sheet of cells over the macula (center of vision in the retina) can contract over time, "wrinkling" the macula to cause a distortion in the center part of vision. Usually, this is "idiopathic" (i.e. the cause is unknown), but the condition may be associated with a retinal tear. This may be treated with vitrectomy surgery in the operating room to remove the membrane causing the wrinkle. A special staining techique with Indocyanine Green dye is used to assist in the procedure.